Provide comfort for the family of Duran Jackson with a meaningful gesture of sympathy. 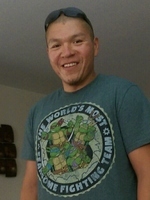 Akwesasne – Duran Neal Jackson, 32 of 150 Tarbell Road, sadly passed away Friday, March 15, 2019. Duran was born May 4, 1986 in Malone, NY to Suzanne Jackson and Lincoln Roundpoint. Duran attended Salmon River Central School in Fort Covington, NY. He loved spending time outdoors. He was always on the river kayaking and fishing. He also enjoyed hiking in the Adirondacks. Duran was a skilled carpenter, always ready to help someone get the job done. Many didn’t know he enjoyed drawing and was a talented artist drawing his favorite characters from dragon ball-Z and marvel movie characters. He loved animals, recently adopting two rescue cats and then proceeded to build them a big house in the backyard. He loved his tunes and you could often hear it throughout the neighborhood while he worked. Duran loved those warm summer nights and building a good bonfire. Most of all, He enjoyed spending time with his daughter Kaydence and making the backyard a fun adventure for her. He also loved when the whole family got together for family dinners. He was a kid at heart and entertained his little cousins by building tree houses way out in the woods for them or taking them ice skating through the frozen crick. Duran is survived by his daughter, Kaydence Maci Jackson; his loving mother Suzanne Jackson; his father, Lincoln Roundpoint; his grandmother Christy Roundpoint, his chosen, father, Lawrence Jackson Jr.; his sister, Sunshine Roundpoint and her daughter Ocean; his brother, Clearwater Roundpoint and his children, Quinten, Avery, Iesha, Kaysia & Jayden; his brother, David “Dude” Terrance and his daughter, Iakohna’kahste. He is also survived by many aunts and uncles, Candace Jackson also his Godmother, Charlie Jackson (Sharon), Clayton Jackson, June Jackson also his Godmother, Aubby Logan also his Godfather, Larry Jackson Jr. (Sandra), Arlene & Don Baker, Louie Roundpoint, Gail & Amos Delormie, Toby & Maryfaye Roundpoint, Plumboy & Theresa Roundpoint, Beverly and Dan Rourke, Jamie and Sheri Roundpoint, and Tammy and Mark Terrance and many cousins. Duran was predeceased by his grandfather, Lawrence Jackson Sr. in August 2003; grandmother, Suzanne Jackson in August 2018; his uncle, Bruce Jackson in November 2008; and his grandfather, Thomas Roundpoint in October 1973. Friends may call Thursday from 2pm-6pm at his home 150 Tarbell Rd. An intimate family burial service will take place in the spring. To send flowers in memory of Duran Neal Jackson, please visit our Heartfelt Sympathies Store. We encourage you to share your most beloved memories of Duran here, so that the family and other loved ones can always see it. You can upload cherished photographs, or share your favorite stories, and can even comment on those shared by others. Provide comfort for the family of Duran Neal Jackson by sending flowers. I'm very sorry to hear the loss of Mr.Duran.It is very difficult to loss our dear loved ones in death. Scriptures from the bible has always helped me to have a hope and comfort. May it help you too. “There is going to be a resurrection.”​—Acts 24:15 ("If a man dies, can he live again? I will wait all the days of my compulsory service Until my relief comes.You will call, and I will answer you.You will long for the work of your hands"-Job 14:14'15) God promises to bring back to life countless people who have died, and he yearns to do so.And as our creator he has the "ABILITY AND POWER" RESURRECT OUR DEAR DEAD LOVED ONES.